Since the beginning of time, people have cherished family as the foundation of their lives. Even though families may vary in culture and traditions, it’s universally accepted that a conventional family consists of a father, a mother and their children. According to God’s will, this is what makes up the family system. The fact that the earthly family system includes a father, a mother and children is not arbitrary; it is the result of God’s divine providence to show us the existence of the heavenly family. The fact that the earthly family system includes a father, a mother and children is not arbitrary. We have all had fathers here on earth who disciplined us, and we respected them. So it is even more important that we accept discipline from the Father of our spirits so we will have life. The writer of Hebrews makes a point in emphasizing that we all have human fathers. This illustrates the fact that fathers are representations of the Father of our spirits. We know that our human fathers dwell on this earth. Where, then, is the Father of our spirits? He should be in heaven. With this in mind, we can understand that the Father of our spirits is God the Father in heaven. Just as we have human fathers in the earthly family system, we have a Heavenly Father in the heavenly family system. In the earthly family, which is a copy of the heavenly family, there are also children. The children of a father are distinguished as sons and daughters. This means there are sons and daughters in the heavenly family as well. Our Heavenly Father acknowledges us as His son and daughters. Through this verse, we come to realize the fact that we are heavenly children. Just as the earthly family is composed of a father and his children, the heavenly family is composed of the Heavenly Father and His children. On earth, children of the same father call each other brother and sister. In the same way, we, who are children of God the Father, are called heavenly brothers and sisters. On this earth, it is common knowledge that in order for a man to become a father, there must be a woman—a mother—who gives birth to his children. Without a mother, there can be neither children nor a father. There is a definite reason God taught His disciples to call Him Father. The paternal title “Father” was used because there is surely an opposite maternal existence to God the Father. The Bible teaches there is also God our Mother. Here, “our” refers to the sons and daughters of the heavenly family. Then, as the children of the heavenly family, who is the Jerusalem that is above? She is our Mother. She is the Mother of our spirits. Just as we cannot physically exist without our human mothers, our spirit cannot have spiritual life without God the Mother. As the primary life-giver, a mother’s role in a family is extremely important. The role of our human mothers is a vivid reflection of the role of our spiritual Mother. It is often said that a mother is like glue that holds a family together. From whom did mothers inherit this characteristic? Just as fathers inherited their character from God the Father, mothers inherited their character from God the Mother. A mother’s sympathy, devotion and sacrifice for her children are all derived from God the Mother. God the Father, God the Mother, and their sons and daughters—this is the heavenly family, and the prototype for all families on this earth. Parents and their children are related through the bond of their blood. This is the absolute way to prove someone’s natural parents on earth, which mirrors how the heavenly children are able to prove they are the sons and daughters of heavenly Father and Mother. Through their blood, parents give their children life. Similarly, through Their blood, God the Father and God the Mother give spiritual life to their children. The blood mentioned above is the blood of God contained in the Passover wine. As Jesus uttered the words, “This cup is the new covenant in my blood,” He promised us His blood through the Passover wine so that when we drink it, we can inherit the blood of the Heavenly Parents. 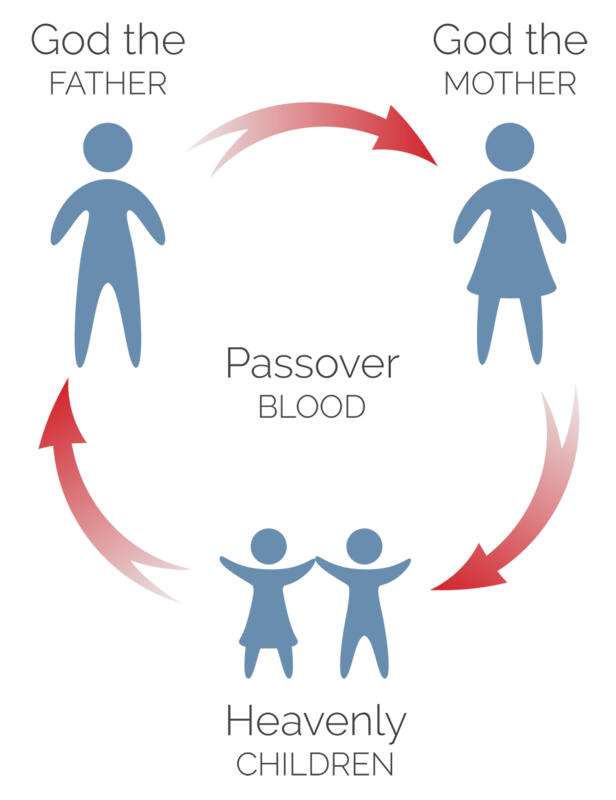 The Passover is the spiritual blood test that proves we are children of God. Once we keep the Passover, receiving the blood of God, we can call God our Father and Mother. The Passover testifies we are members of the heavenly family. The Passover testifies we are members of the heavenly family.